The 2014 entry. Photo courtesy of Missouri S&T Formula SAE Racing website. 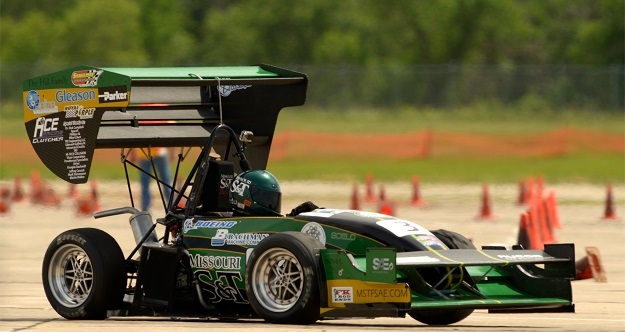 A team of students from Missouri University of Science and Technology has designed and built a Formula One-style racecar and will race it at the Michigan International Speedway as part of Formula SAE-Michigan. The event, a national student design competition sponsored by SAE International, will be held May 11-14. The competition challenges students to design, build and operate small-scale cars. Missouri S&T’s team will compete against more than 100 other teams from around the world. During the competition, a skid-pad event tests the car’s turning and cornering on a figure-eight-shaped course. An acceleration test measures the car’s speed over a short distance. A one-lap autocross event proves the car’s maneuverability on a tight course and determines the starting order for the final event – an endurance race to prove durability. In the endurance race, the car must withstand the stress of long-term driving at elevated speeds. Each race is timed to rank the teams; none of the events are head-to-head races.